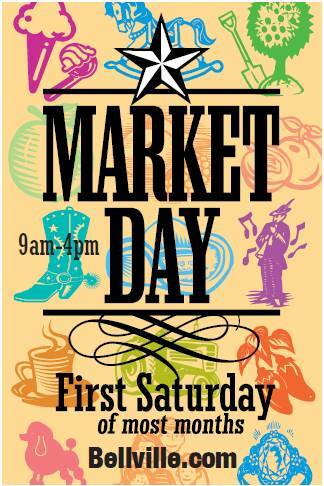 FIRST SATURDAY MARKET DAY - Vendors set up their wares around the historic courthouse square. A great assortment of booths! Lots of arts, crafts, collectibles, jewelry and antiques. Great food and live entertainment in the relaxing atmosphere of small-town Texas! No admission and free parking! Please join us for a fun day in the country...with something for the whole family! Call 979-270-1434 for more information. WE'RE ALWAYS LOOKING FOR NEW VENDORS, ARTISTS, CRAFTERS, DEALERS, FOOD VENDORS, AND CHILDREN'S ACTIVITIES! For questions about booth assignments or to make arrangements to attend, contact Tammy Bond at 979-270-1434.